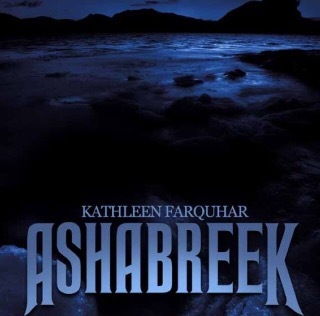 Here is an Excerpt from Ashabreek by Kathleen Farquhar! Excerpt:::The realization that she was not quite as numb as she had thought was forced into sharp perspective when six rows of razor-like teeth pierced into her legs and hips. They clamped down with the force of an enormous and powerful jaw. Babette screamed bubbles as the water beast dragged her deeper into the lake’s seemingly endless depths. She had no more breath; she was struggling to keep from inhaling as she tried to free herself from the jaws of the beast. She was too weak to pry its mouth open. The beast responded to her attempts by clamping its jaws down harder snapping her femur in two. Babette screamed the last of her air in a series of feeble bubbles…and took a breath. Even at the bottom of the lake where the beast was beginning to slow its pace, air was coming to her freely. Confused and afraid, Babette started screaming bubbles again, though not sure how she was able to breathe so deep underwater. She had no doubt that once the thing was comfortable, it’d feast on her. The thing that had carried her away from the surface was long and scaled with a tail-shaped like an axe. It was a strange cross between a fish, a shark and a serpent; it had a single eye, glowing bright orange, and its teeth that were imbedded into her flesh were sharp as knives, two inches long at least. Babette tried to scream again, but even while able to breathe, she could only scream infuriatingly silent bubbles. Babette struggled for freedom as someone dove into the water after her. Babette’s little body couldn’t handle the pain or the cold; she blacked out as the beast made ready to enjoy its meal. This entry was posted in Uncategorized and tagged book, book lover, bookish, books, excerpt, new author on June 29, 2016 by taleasoldastime31. The Fangs of Freelance cover reveal and giveaway! The Perfect Tear summary and Excerpt! The Portal Series: Blue City Synopsis and Excerpt!